Here at Las Vegas Environmental Pros, we specialize in asbestos removal or asbestos abatement. Our highly qualified team is dedicated and OSHA licensed specifically for asbestos removal. Asbestos abatement is an extremely delicate process and one that is to only be done by certified licensed and bonded professionals. Our asbestos removal team is just that, trained to perform the smallest to the largest asbestos abatement jobs. We maintain a full-time staff that is available 24/7 for any asbestos removal emergencies. Our company’s guarantee is to be at your site within 4 hours of the initial inquiry and provide complete assessments of the asbestos removal process necessary. We work with all the regulatory agencies to ensure proper asbestos abatement. One of the most frequent questions we get is “How do I know if there is asbestos in my commercial building or private home residence?” Many older commercial buildings and private homes contain asbestos. Asbestos is a spray applied type of flame retardant and it is also used in pipes and fittings to maintain temperature control. It was also used in residential properties in what are called popcorn ceilings or cottage cheese ceilings. It is found in weathered asbestos sheeting to protect roofing and siding from outdoor elements as well. It can also be found in drywall, paint and insulation products. Asbestos was found to be extremely toxic and was banned in the United States in 1978. Because builders were still allowed to use the rest of their on-hand asbestos inventory, you may be able to still find asbestos in properties built up to 1986. That’s why it is imperative that any and all structures built up to 1986 get the proper inspections to determine if there are asbestos contamination issues. In refurbishing an older commercial building or residential property, it is extremely important and mandatory by OSHA to collect a sample of specific products and materials and have it tested by a certified laboratory. Asbestos removal, or abatement, is a tricky process and needs to be performed by a licensed asbestos removal team. Here at Las Vegas Environmental Pros, we have the highest qualified and licensed team for all of your asbestos removal needs. During the asbestos abatement process, there are several crucial items that need to be addressed. One, making sure that during the asbestos removal process that all precautions are taken to not contaminate other areas, the general public, and our asbestos removal team. We take all safety measures to ensure that any asbestos removal project will be properly handled and the asbestos removal will also be disposed of in the appropriate matter. 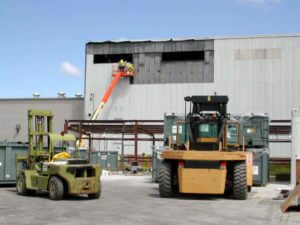 OSHA provides our team with specific guidelines on the disposal of the asbestos removal process. It is also not out of the ordinary that asbestos is accidentally found. Certain circumstances such as a flood due to a plumbing issue or a storm that knocks down a tree into a building can be the reason that asbestos is actually found. During the clean up period where either water damage requires the walls to be removed or exposed walls due to an accident, that is when it is common that workers discover the asbestos. 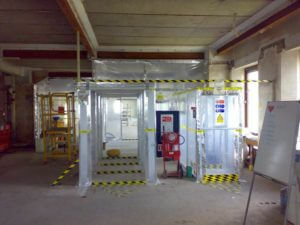 It is at that time that samples of the asbestos be taken to a certified laboratory and be identified as asbestos. Once that item has been carefully analyzed and identified, we then start the careful process of providing a timeline to complete the task of removing the asbestos. After all, is planned and permits are approved, Las Vegas Environmental Pros steps in action and handles everything from there. We handle everything from water restoration to total clean up and the property is then left safe to occupy and proper certificates and permits are issued. Asbestos exposure can be deadly. It can lead to the development of several types of lung diseases such as mesothelioma, asbestosis and even lung cancer. Asbestos exposure is a real danger and the asbestos abatement procedure needs to be taken care of in a safe, urgent matter. Our staff is trained exclusively on the best ways to perform the asbestos removal and the disposal of the asbestos so that no one will be possibly exposed to the asbestos. Our company is family owned and operated right here in Las Vegas. All of the owners have acquired an extensive background and a certified Asbestos and Mold consultant for over 15 years. From start to finish, we work closely with the project managers to ensure a top-level asbestos removal job is performed. Our company prides itself on having an impeccable reputation with the asbestos removal industry and is more often than not referred to projects from past jobs. We are the professionals you want on your team for any asbestos abatement projects. We are proud to call Las Vegas our home and we serve the entire Southern Nevada area for asbestos removal issues. We specialize in asbestos removal, fireproofing, boiler insulation, floor coverings, spray on acoustical materials, lead paint removal, and siding and piping. 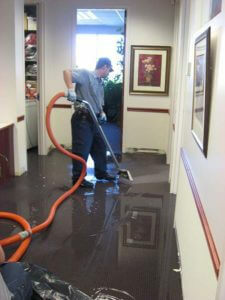 We also specialize in mold removal and water damage restoration. There is no job that is too small or too large for us. We have an extensive background in the asbestos abatement industry. If you think or know you have an asbestos issue, don’t delay and call us today. Las Vegas Environmental Pros is available 24 hours a day and 7 days a week for any emergency issues. Check our About Page for more details. Or hit us on our Contact Page if you just want an email response to a question or comment.